Over the school holiday we went to Karijini National Park. Karijini National Park is in the Pilbara region of Northwest Australia. It’s about 1400km from Perth and it took us two days to get there. Not everbody knows about this place which is a shame but a blessing on the other hand. Karijini is Western Australia’s second largest national park. It has stunning gorges and beautiful waterfalls, also flora and fauna. Many of the gorges have walking trails which varying in length and difficulty. For example Weano Gorges is classified as Class 4, which is the trails are moderately difficult and has steep and natural obstacles including rocks and shallow pool, whereas Class 5 is difficult with lots of vertical drops, slippery, wet rocks and narrow high ledges. We left Perth at around 6.45am. After about an hour or so drive our first stop for caffeine intake was at the little town called Bindhoon. This little town has a cool bakery called The Bindhoon Bakehouse Cafe. They have lots of yummy cakes/slices/fresh bread, etc. And the coffee is good too. I like that place! Second stop was at Wubin, basically just to stretch our legs. Then a bit after mid-day we made another stop at Paynes Find for lunch and let the boys run around (wild). Then on the way we had to stop at Mt. Magnet to make a phone call to the camp ground we were going to stay that evening. Both our mobiles had no signal at all, thanks to Virgin Mobile! It was close to 5 in the evening when we finally got to our camp ground at Karalundi, phewww…after over 9 hours drive, eventually we made it to our first stop. What a day! I like the camp ground, the shower and toilette are clean, kitchen camp is also good. So, dinner was bbq sausage and salad. Followed by tea and biscuits before hitting the sack. Got up bright and shine at 6.30am! While I had a good night sleep, my children and hubby had not, I forgot what was their problem though! On our way to Karijini we stopped at Newman. My T2 was sick, he had very bad headache, aching all his bones, looked like the flu was going to hit him again. My husband and I were very worried. All the way from Newman to Karijini I prayed like crazy for him to be better. Thank You Lord, you listened to my prayers. By the end of the day he became much much better. After about 8 hours or so, around 5 we got to Eco Retreat camp ground at Karijini…yaaay finally! We set up our home sweet home for the next four days. Dinner was pasta with chorizo and salad. Woke up as early as 6 in the morning, had our brekkie and (coffee for mum and dad). First destination was Weano Gorge. Weano is beautiful and stunning. After lunch we continued to Hancock Gorge. This gorge is also gorgeous! I can’t really describe how beautiful it is in words, but it is spectacular! To reach the gorge we had to take the ladder to the bottom and walk downstream (or swim for me) to Kermitts Pool. The trail ends here. It was very slippery, and we had to swim to get back plus climbing up the ladder again, so hard work! Today itinerary is Kalamina Gorge and Dales Gorge. I don’t really like Kalamina Gorge, it is still beautiful don’t get me wrong but compare to Weano and Handcock, Kalamina is the less attractive one. Well in my opinion anyway. The trails are not too hard, which is good! And maybe because today was pretty hot in Karajini, so it was not really my cuppa tea to walk under the heat. We had to have a swim to cool us down before continuing to walk again. I’m trying hard to balance here! Cooling down under the nature shower! Fortestcue Fall. Beautiful and stunning. I like Fortescue Fall, though it was a bit crowded with people swimming and taking pictures. No wonder, it’s really picturesque. Another stop to swim again, well the Boys did. Fern Pool. The fern pool is a sacred Aboriginal place, so quite and no loud noise is preferred. On our way to Circular Pool, which was very hard walking and hot, we had a quick dip at a little creek. It helped us feel a bit cool as the temperature was soaring. Finally after about hour and half we arrived at our last destination of Dales Gorge; Circular Pool. It is really beautiful. First jump the water felt icy cold but then it got warmer once your body adjusted. I swam quite long here, enjoying the serenity and the beautiful surrounding. The pool is framed with all ferns. 1. Joffre Gorge It was so bloody hard work to get down and up again at Joffre. But it’s worth it. We all had a good swimming and had our lunch there. The gorge is really stunning. There are impressive waterfalls, and deep, cold pools! The trail walk is class 5. Just to inform you, you really need good walking shoes and a bit of monkey’s heritage to be able to go down and up again in this gorge, seriously! If you don’t want to go down to the gorge or can’t do the walk, there’s Joffre lookout where you still can see the spectacular curved waterfall forming a natural amphitheater! Knox Gorge Knox is even harder than Joffre, for heaven sake! But the view…you forget suddenly that you still need to climb up those rocks to get back! There are lots of fig trees clinging to the richly colored walls. going up is even harder! This morning we packed our tent and we moved to what it is called ‘glamping’. Well, this type of glamping which you don’t have to set your tent up and you can sleep on the comfy bed complete with blanket and nice pillows. But you still have to share shower and toilette, the shower is even nicer and cleaner. For your information one night glamping is AUS$240…that’s why my darling husband only booked us for one night! Well, better than not at all 🙂 So tonight we are glamping and eating out the Eco restaurant. The food was average, though my garlic prawn was very delicious. And the chocolate mousse was to die for! Love to sleep on the bed again tonight! Bye bye Karajini National Park, bye bye glamping! We were heading to Tom Price today. On our way, we detoured about 1hr to Hammersley Gorge, last gorge in our list. Hammersley was as stunning as any other gorges! We did lots of swimming and jumping off the rocks. 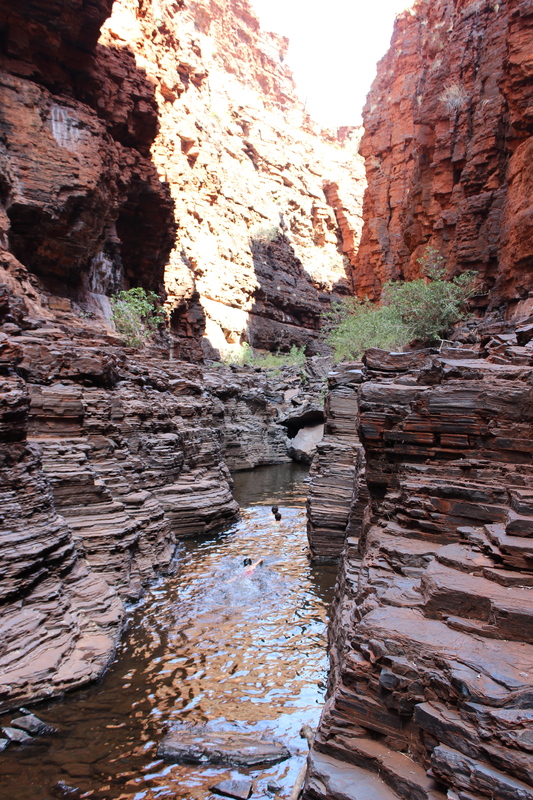 The structures of the walls of Hammersley gorge is rich with texture and layered in different colors. Ever changing light and astonishing colors and reflections highlight the geological forces in this spectacular landscape. The waterfall and the “spa pool” are really beautiful. After Hammerlsey, we headed to Tom Price. We camped at Tom Price’s caravan park. After buying ice-cream and some cold drinks, we drove up to Mount Nameless, yes the name is Mount Nameless 🙂 Situated about 4km from the town centre, Mount Nameles can be accessed by 4WD only. There is also a walk trail to the top of Mount Nameless. From the summit there are spectacular views of the surrounding country. Chinese take away for dinner tonight! BBQ and salad again for dinner. Day 8: We are heading HOME today…yaaay! This holiday is over, we all had a good time. I think it is a good experience for my kids to be able to see Karajini National Park, and I’m proud of these two monkeys of mine who are very good walkers, climbers and traveler. If you are wondering whether we got bored while we camp, the answer is no. Since we get up pretty early every day, then did our walking and not back to the camp sometimes close to six o’clock. After cooking, dinner, and tea we are pretty much knackered. Some nights I had the energy to read my book or playing solitaire on Iphone. Life on holiday is never dull….. so far. Hope you enjoy the pictures and the little video that my T1 made 🙂 It took me a while to finish this! what a lovely road trip !!! bucket list aku bgt nih bisa camping an di Aussie & NZ too..
wahhh seru ya… walaupun keliatannya emang cape ya… hahaha. What a picturesque view! You look stunning too, Ria! Nice post! Aaahhhh…. Foto2nya itu lhoooo!!! Laki gw kl ditunjukin ini pasti lngsg ngajakin pindah ksana, hahaha. And it looked like you got the place to yourselves! How lucky!!! mba ria.. salah kenal.. hehe.. gilaa.. semua votonya kyk yg ada di pinterest semua gt. bagus2.. hehe.. cliff jumping gt seru bngt deh rasanya. haha.. btw.. aku punya temen yg punya burgershop di perth.. orang indo jugaa.. namanya v burger bar.. siapa tau kenal juga.. hehe..
Ma kasih, foto2nya masih amatir banget koq. Tapi memang viewnya spectacular deh.